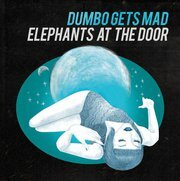 One man Italian band Dumbo Gets Mad delivers the UFO of the beginning of 2011 with "Elephants at The Door". After some investigation, it appears that the guy is coming from Reggio Emilia, a small town not that far from Bologna, he's collecting Sonic Youth albums but don't listen to them that much, he is obsessed by waves (hence the video for "Plumy Tale"*, he digs Captain Beefheart (which makes him part of my family) and read Don deLillo (I haven't read this chap and maybe I should) *. He even wears a mustache, but that can be shaved the next minute. What won't be erased from memory in a while is the impression and pleasures given by this impossible but true album. Very much drowned into the DIY idiom, maybe for lack of other ways, the guy's got access to a recording studio*, his own or some neighbours, no one can tell but him. The fact remains, sonically, this is the richest and most layered record you will stumble upon in a while, past or future. The amount of different sounds, from vintage synth to guitar effects and tape machine through water bubbles and alien voices give the effect of floating into some very busy outer space, or the deepest ocean, surrounded by the most extravagant but friendly creatures, and even a mermaid, if you like : this fellah's girlfriend is singing here and there when she feels like it, it looks like : capricious, playing hide and seek, temptative or little worrying, just like... a mermaid. The music can obviously be described as highly psychedelic, slightly like playing two different "Nuggets" compilations at the same time while throwing some electronic beats and deep funk extra grooves for good effects. And there are songs, with refrains, or not, and incredibly addictive melodies like on the first single "Plumy Tale" but also on "Electric Prawn" or singalong kind of hymns like "Harmony". Following one source*, the guy was very much inspired by the late Gonjasufi and Flying Lotus (again) records, and there's something of them, parcimoniously most of the time and more prominently on the last track "You Make You feel". The later sounds like some pastiche of danceable electronic music at first but it's another trompe-l'oeil from the man behind the curtain. A growling trumped answered by a splash of analog electronics, possibly a moog, underlined by some exotic percussion and decorated by maybe the most melancholic vocals on the whole album. This last track is also the less textured of the album, if you can believe it, and presents a perfect end to it. Now the first track "Limbo's Village" is a short instrumental which serves as a rather soft introduction to the album. You know where you are at first, some 43 or 44 years earlier, around 1966 and 1967, when most of the tracks on that Nuggets compilation were recorded, but also the very first Pink Floyd, The Red Crayola, The Electric Prunes, The 13th Floor Elevators and even Captain Beefheart. Prominent crawling buzzing bass, groovey rolling drums and huge waves of vintage synths. Our host added some birds for warm up. The word "Limbo" is in the title of that first track, this was just the front door. "Plumy Tale' represents the real greeting with open arms to the fantasy near cartoonesque world of Dumbo Gets Mad. "Pink Elephants on Parade" was a "1941 Disney cartoon in which Dumbo, after accidentally becoming intoxicated, see pink elephants sing, dance, and play trumpets during a hallucination sequence"*. Well, you are in it, right away. Just add some waves, the wide blue sky, the blinding sun, and surfers on the horizon, there you are. Over there, in this phantasmagoric landscape, kids are dancing throwing marmalade all over the place and sometimes in their or other hungry mouths... something like that. "Marmalade Kids" begins with a near hip hop beat, another groovy-buzzy bassline and circular synths to introduce the vocals which are very close to a sweet Flaming Lips, one of the only moment it is possible to reference some other band here. Even the big second drumline which appears later is very Flaming Lips-like but the whole song is more addictive and warmer than near anything the Lips did on their part. Maybe because there was no Dave Fridmann as producer to saturate the whole thing and premeditatingly damage your eardrum. So Dumbo Gets Mad is a better producer than the big Dave? Possibly. After all this activity, it's time for "Sleeping Over", but your dreams will get as colourful and unexpected as reality, if not more, being dreams. Aren't these some little green men from outer space singing like a mix of Donald Duck and Calimero over there? Whatever. This track sounds like some twisted new wave mixed with French band Air but with three times more layers and a cocktail of unearthly sounds. Electric guitars come out on the next track "Harmony", another very bubbly psych-pop song which will stick in your ear like gum. It's also the rockiest thing on the record with crispy sounds appearing everywhere. The tempo slows down with "Why Try?" and its slow snaky bass and sleepy vocals. The overall extra sounds are reminiscent of some John Barry or even Ennio Morricone soundtrack, surely the intro. 'Electric Prawn" was the second extract of the album to appear on the net. The funkiest song but there's more to it, of course. "Self-Esteem" is a fusion of so many things that it's hard to describe, there are so much cheesy new wave synth melodies plus winks to some cheap disco and twisted easy-listening cocktail music that you just don't know wtf is that but you're enjoying it anyway. The ghost of Raymond Scott, one of the first electronic pioneers, he invented his own instruments and was maybe the first musician to use the moog synthesizer, appears on "Raymond Play" from the very first near alarming highpitched notes coming out of a... moog or something to enter into some singalong voice with la la la la lala and ooooooh woooh woh woooh and the whole thing sounds like some party before departure. The already mentioned "You Make You Feel" and its more down-to-earth soundscape, compared to the rest of the journey, take the listener in the palm of its hand to land him or her softly back into the wide awaken world after the very last note and sound. Melancholy emerges. One little complain though : the album is sometimes so dense that it gives here and there the impression that some part of it got stuck at the surface of your ears like being under water or having a blocked nose. The best way to listen to this thing is on a pair of headphones. This album is marvellously enjoyable and fresh, opulently textured and as light as whipped cream, and it's also, and besides its huge ambition, but I would say its enormous and contagious enthusiasm, the least pretentious album of late. Finally, it is refreshingly unique and I could give 50 so called indie albums for one "Elephants At The Door".